Lotus Flower Water Feature: Created for the Pashley Manor Show 2007, the water feature comes complete with two heads, the bell and fountain head so that different looks and sounds can be achieved depending on your mood. It can be a stand alone feature, ideal for roof gardens and terraces, or can be incorporated into a pond. 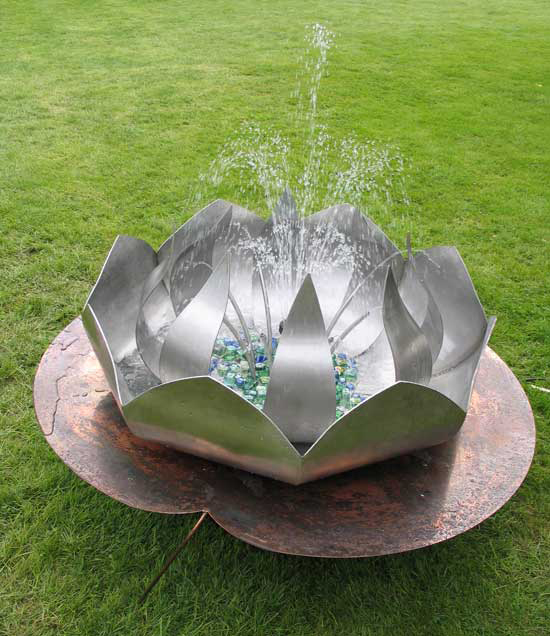 The lotus flower is made from marine grade stainless steel and the lily pad from copper to allow for natural green patination, which over time will enhance the look of the feature.The size of the water feature made for the show was 1000 x 1150mm, however any size can be made to commission.